GUEST BLOG / By Eric Peterson, PillartoPost.org Dining Critic—Frankly, I’m a meat-and-potatoes guy, but as your ersatz food writer and restaurant critic, it dawned on me that a dispatch on the state of San Diego’s seafood restaurants is long overdue. However, I was tentative about doing the research for this column. I’ve always considered fish a waste of a good appetite. But now I realize that going out to a restaurant and ordering a piece of fish is like visiting your crazy Aunt Bessie in the retirement home. You do it every once in a while because you know it’s the right thing to do, and when you finally do it, it isn’t nearly as bad as you thought it would be. In my snooty world, seafood restaurants are segmented like the ecosystem of the ocean, rendered in cutaway fashion on a poster that hung in one of my middle school science classrooms. Dwelling on the muddy floor are lowly sea creatures too numerous to count—the “quick-service restaurants” where you stand at a deferred maintenance counter and order from items listed on a menu board. Most everything in this low-end counter category is deep-fried and called a fish taco. Still deep in the briny restaurant milieu are the low-end sit down establishments. A high school student masquerading as a restaurant hostess seats you in a brightly lit dining room that has brass portholes instead of windows. The heavily lacquered tables are covered with paper placemats and unidentifiable goo. The walls are adorned with rusty sea anchors, fragments of boat parts, and colorful glass floats bound in fishnets. The servers are poorly trained, if at all. These places abound in noise and germs, their laminated menus stick to your hands, everything smells like fish, and you walk out feeling actively ill. You’d find a better wine list in a gas station. When it comes to seafood restaurants in the fine-dining category, meaning where, in my science poster of bygone days, the ocean meets the sky, the gold standard was Scott’s Seafood Grill and Bar, in Orange County. In 1989, Englishman Malcolm Stroud, a formally trained chef who once plied his trade aboard Cunard cruise ships, teamed up with Simon Snellgrove, an Australian financier, to open this elegant, landmark restaurant amid some of the highest-priced retail properties known to man: South Coast Plaza. Located adjacent to the Segerstrom Center for the Arts, Scott’s Seafood Grill and Bar was a restaurant palace to behold. Its vast and well-appointed dining room buzzed with the energy of an opening night on Broadway. Chic and fashionable theatergoers packed the restaurant’s upholstered booths and vast, round tables. The white linen was always fresh, as were the stunning floral arrangements that brightened the classic plantation-style interior. In the wide aisles, busy servers dodged one another, delivering champagne in ice buckets here, oysters on the half shell there. As curtain time at the Arts Center drew near, a busser went through the dining room, sounding a chime. Jake’s Famous Crawfish in Portland is one of the few West Coast seafood restaurants favored by our Cranky Diner. PillartoPost.org photo by Eric Peterson. To this day, the lemon-garlic calamari at Scott’s has not been duplicated. With Scott’s in Costa Mesa, Stroud and Snellgrove elevated the gastronomic and sensuous experience of fine dining in a dinner house where the slant was decidedly in favor of seafood, building on white-tablecloth, legendary restaurants like Jake’s Famous Crawfish in Portland, OR, and the Legal Sea Foods chain on the East Coast. Scott’s Seafood in Costa Mesa closed in 2015 when Snellgrove decided not to renew the lease, and the world has never been the same. Scott’s had its roots in San Francisco. Stroud opened his first restaurant, the Coachman, on Powell Street, in 1961. In 1976, he opened the first Scott’s Seafood, at Lombard and Scott, in the Marina District. Stroud went on to hang the Scott’s banner on eight restaurants in the Bay Area, Sacramento, and Orange County. In addition to being an incomparable chef, Mr. Stroud was a gentleman, a golfer, and a perfectionist. He helped a number of his employee-chefs open their own restaurants. Few things about fine dining horrified him more than food touching other food on a plate. To this day, Mr. Stroud’s loss (he passed away in 2012 at the age of 79) is profoundly felt throughout Southern California’s fine-dining seafood landscape. And, unfortunately in our region, few seafood restaurants are on par with Scott’s. I can’t even find one that I would patronize with zeal. I’ve seen some beautiful, inviting build-outs, perused some promising menus, and chatted with some amiable, well-intended managers, but when the food came out, the flamboyant promises of the bill of fare proved the emperor’s clothes: calamari with the consistency of chalk, Caesar salads so bland they could’ve originated at Denny’s, and sea bass so stinky that I could smell it coming out of the kitchen. And far too often, food touching other food with reckless abandon. I remain shark bitten to explain why quality seafood in Southern California is so spotty. Isn’t the world’s largest ocean just down the block? Let’s revisit the poster. Closer to the surface of the ocean, where the water is turning blue, we find the crème de la crème of casual-dining seafood restaurants. Better wine lists, heftier cutlery, fresh fish, a trained and knowledgeable wait staff—in San Diego, I put the Fish Market, at 750 N. Harbor Drive, at the top of the casual dining category. 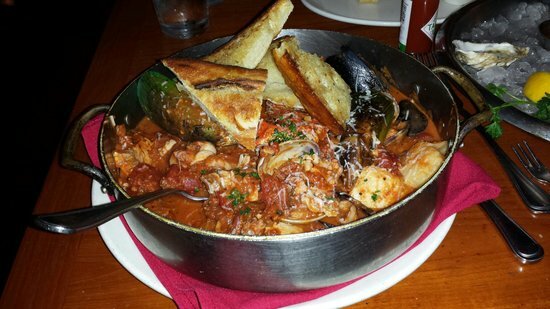 The Fish Market’s cioppino is perhaps the best I’ve had anywhere, not counting my table at home, when Teresa is doing the cooking. Fish Market's ample menu and unobstructed view of the bay make it a winning choice for a rainy day lunch when the crowds are down. Their cioppino is perhaps the best I’ve had anywhere, not counting my table at home, when Teresa is doing the cooking. If, like me, you have a compulsion for tearing off chunks of toasted sourdough French bread and shamelessly mopping up the stew in your cioppino bowl, ask for a paper bib along with your crab and lobster tools, and wear it proudly. It signifies that you’re one of us. An equally inspired choice for lunch is Sally’s Fish House & Bar, at the Manchester Grand Hyatt (1 Market Pl.). Its delightful, sun-drenched patio overlooking the Marriott Marina is perhaps the best people-watching spot in town, and their selection of entrée salads will satisfy even the most health-conscious diner. The Baja cobb is a work of art. The fish and chips, made from sea bass and served with steak fries and malt vinegar, is borderline decadent. For larger appetites, try Sally's open-face blackened swordfish sandwich or the grilled beef burger, which may be the best hamburger south of The Veranda Fireside Lounge & Restaurant at the Rancho Bernardo Inn. Fortunately, the dearth in higher end San Diego seafood restaurants comes with an elegant workaround. Fish lovers can get the best of Poseidon’s crop at a handful of reputable downtown steak houses: Donovan’s, Ruth’s Chris, Fleming’s, and Morton’s. Pan-seared halibut, sesame-crusted ahi tuna, miso glazed Chilean sea bass, Alaskan king crab legs, whole baked Maine lobsters, chilled seafood towers and sweet chile calamari to start—the broad array of seafood options clicks nicely with the sumptuous steaks, liberal martinis, and lavish wine lists that keep me counting myself a happy regular in these watering holes. Bottomline: Except for the aforementioned high spots, if you want consistent quality seafood look to the menu's of San Diego's top end steak houses. But this doesn’t mean I’ve given up entirely on seafood in San Diego. If, at dinnertime, you’re out in the Gaslamp District and you spot an old chap in deerstalker fore-and-aft cap, Inverness cape, and smoking a calabash pipe, leave him alone. It’s Sherlock Holmes. I’ve commissioned him to find the very best fine-dining seafood restaurant in San Diego. Last I heard, he’s still looking. The Cranky Diner appears exclusively on PillartoPost.org Daily free online Magazine.